Can We Capture the “Magic” of a Gondola Ride? As I sit on my balcony in Venice watching the seemingly endless stream of gondolas go by on the canal below, I am always amused by the way everyone on the gondolas are beaming with smiles, holding hands, laughing, and trying to enjoy every second of their “magical” experience. I know what it it’s like. I too was once a 1st time gondola rider many years ago while on vacation, and I too was in pure bliss, wanting to take it all in. 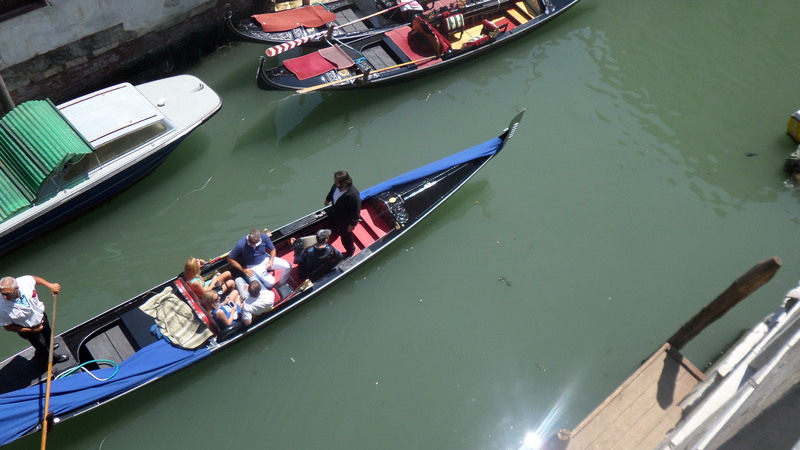 The funny thing to me is that as soon as everyone exits the gondola, their normal behavior will often return. A wife snaps at her husband for not taking enough photos. Kids starts whining about being hungry. A group discusses what they should see next. Smiles quickly fade. Hands are no longer held. The magic fizzles away. Reality sets in. Or, the magic will sometimes continue for awhile or even during the entire time in Venice until reality sneaks up on them on the plane or packing to leave. Why is it that we are all on “best behavior” during vacations or special times, but then go back to our “normal” selves after these moments end? But isn’t everyday precious? What if we could try to capture that same feeling we have on a gondola in Venice, or strolling along the Seine in Paris, or on a one-week dream trip to Hawaii and bring it into our daily lives.? This concept of capturing the vacation bliss is basically what I have tried to do by moving to Venice, and Paris, and Rome, and Amsterdam, etc… But what I have found is that life finds it’s way in, even if you live in paradise. There still are bills to be paid, kids that need to do homework, laundry to be done. Although, I must admit that life is a whole lot sweeter when I can cook dinner while listening to “O Solo Mio” being sung by a gondolier below, or drive by the Colosseum in Rome while picking up my girls from a playdate, or walk through Dam Square in Amsterdam on my way to the supermarket. Living in my “dream” cities has helped me capture at least some of the magic of a dream vacation. Although no place is perfect, if we live in a place we love surrounded by people we love, magic is bound to happen…at least some of the time!! How about you? Do you have any thoughts or tips on how to keep that magical vacation feeling alive long after the vacation has ended? Please share your thoughts with us! SO many thoughts…and dreams. If we could all just plant a money tree then the vacation at home or in paradise could live on. Until then, we power through. Eat the foods we want and stop worrying about a few pounds, catch a mid day movie, don’t just say “lets get together” sometime…actually do it! Choose battles to fight with the kids, eat lots of dark chocolate and drink lots of good wine!!! !